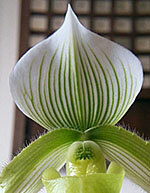 Glossy white petals with avocado-green stripes give this Paphiopedilum a certain jungle chic. A testament to its exotic nature, the blossom of this "carnivorous" orchid has a pouch that lures insects inside to pollinate it. 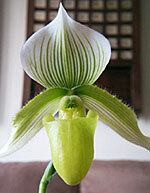 Regardless of the danger this plant may present to bugs, humans can enjoy Paphiopedilum indoors with very little care. To learn how, see, IMPORTANT CARE INFORMATION for details. The perfect touch to this elaborately detailed arrangement, the vintage Chinese woden planter hails from the province of Shanxi in Northeastern China. This genuine piece is more than 100 years old. 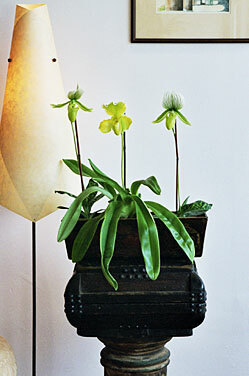 Single-stem potted slipper orchids can be placed anywhere in your home and will bloom for approximately 1-2 months.